In holding together scarcity and abundance, leaning into constraints even as we focus on bolder ambitions, we will discover the greatest opportunities for transformation, writes the executive vice president and provost at Baylor University. Nonprofit institutions are often constrained by size, funding, staffing and the immensity of the challenges they are trying to address. This has been even more acutely felt in the years since the 2008 economic meltdown, which exposed the fragility of these institutions and intensified their fractures. Christian institutions seem to be especially constrained. The constraints are exacerbated by deep trends that are causing even large Christian institutions to suffer, and their leaders to feel discouraged. Yet could it be that the ways we are responding to these constraints are actually making things worse? Might the constraints themselves also be blessings that could enable us, and require us, to find generative solutions to the wicked problems we are addressing? They observe that constraints come in multiple forms and vary in intensity: there are constraints of “foundation” (something that is basic to the enterprise, such as a building); of “resource” (funds, people or expertise); of “time” (the ability to control and meet a deadline); and of “method” (possible ways of accomplishing something given the organization’s capabilities and requirements). Often, the constraints we face combine two or more of these forms, and the intensity can seem overwhelming. The authors’ key insight is in delineating the ways we tend to respond to constraints: as victims, neutralizers or transformers. They point out that these are not so much personality traits as they are reactions we all tend to have at one time or another. We are thus able to shift from responding as victims or neutralizers to acting as transformers (though we can also lapse from a transformational approach back to feeling like a victim). Victims lower their ambitions in the face of constraints, allowing the constraints to defeat them. Neutralizers don’t lower their ambitions but develop workarounds to try to deal with constraints. Transformers see constraints as opportunities to approach things in a fresh way, perhaps even increasing their ambitions along the way. 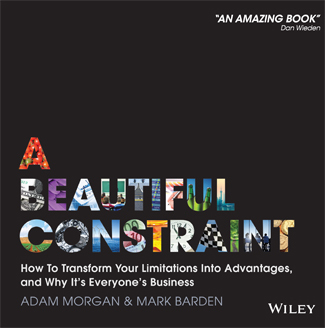 As these descriptions suggest, a crucial element of seeing constraints as beautiful is our ability to become even more, rather than less, ambitious in what we think is important and possible for our organizations to accomplish. We need to see constraints and ambitions as opposable rather than oppositional. Our organizations’ ambitions can be for growth, or impact, or quality, or superiority, or delivering a specific experience -- or, typically, some combination of those. When we hold “bold ambitions” and “significant constraints” together in opposable tension, we can discover breakthrough opportunities. We discovered this at Duke Divinity School in the wake of the 2008 economic crisis. Having stumbled across a wonderful distinction by James Surowiecki (building on the work of Peter Dickson and Joseph Giglierano) between organizations that seek to avoid “sinking the boat” and those that seek to avoid “missing the boat” in the face of crisis, we focused on the latter. We worked together to double down on our ambitions to be a resource for equipping the kind of leaders the church needs in the 21st century. We took seriously the constraints we faced, and they were daunting. I moved through many days feeling like a victim of external forces and constraints, and occasionally I worked myself into a space where I felt like maybe we could be neutralizers. But we also stumbled together into a conviction that perhaps our constraints were an opportunity to transform our situation by developing breakthroughs in how we thought about our foundations, resources, time and methods. We held together, opposably, our significant constraints and our bold ambitions. We launched several major new initiatives, including new degree programs, that we might not otherwise have undertaken. “activate emotions” that help us persevere, including both negative emotions (such as fear and frustration) and positive ones (such as excitement and desire). The authors also note that we need to hold scarcity and abundance in opposable tension; simply to oppose them, as I have often done, can come across as naive. This is particularly important for Christian institutions. We know Jesus’ words and actions that embody abundance, and often preach and teach with a focus on abundance (the fourth step in transformation above). But the important insight here is that it is in holding together scarcity and abundance -- leaning into constraints even as we focus on bolder ambitions -- that we will discover the greatest opportunities for transformation. Christian institutions are well-positioned to see constraints as beautiful and to lean into the activities that could make us transformers. After all, whatever our constraints, we are called to bear witness to God’s reign and to trust that the future is guided by God rather than us. With our focus on God, we can afford to be even more experimental and bold in our ambitions. And we can lean into both constraints and ambitions, because we are called to embody hope, the virtue that prevents us from lapsing into either pessimism or optimism. These convictions, though, require Christian leaders to become even better storytellers. We need to be able to help others in our organizations remember the larger horizons of our purpose, our “Why?” in relation to God’s story. We need to tell these stories in ways that cultivate traditioned innovation, drawing our attention to both past and future in ways that enliven the present as a time of hope. They believe transformers are made, not born. They steer their organization toward constraints, not away from them. They set a high level of ambition alongside the constraint, and legitimize that ambition. They know when to reject compromise of that ambition. They get people to believe that a solution is possible. They use tension and storytelling to generate a longer-term emotional commitment. They encourage and enable their teams to challenge current routines and assumptions. They know how to manage the transformation threshold. These sound like characteristics that ought to be “natural” for Christians, given the story we are called to inhabit and the God we serve. Why, then, do we so often allow ourselves to live into either a “victim” or a “neutralizer” mentality? As Christians, our mindset and our motivation ought both to be high if we are truly living into the horizons created by the Holy Spirit. But we often haven’t known how to start; our methods have actually dragged down our mindsets and our motivation into the realm of victims and neutralizers. The activities described in “A Beautiful Constraint” can help us rediscover how to start. As we do so, we will begin to see that constraints and ambitions, held together opposably, can help us achieve breakthroughs for our organizations, and a more faithful and effective witness to the God who is making all things new.